As my wife and I were decorating the interior of our house for Christmas, we eventually got to the dreaded “Christmas Tree Lights”, which, of course, failed to light on one half the string. Of course, being an engineer, I’d rather spend countless hours developing the “engineering” solution, rather than replacing the lights one-by-one. Besides, what if there are two bad ones? After thrashing around helplessly, I finally went to the internet for help. Well, it turns out there are many schemes and specialized tools for determining which of the lights are bad. In fact, we had one of those handheld gizmos that detects minuscule current flowing through the bulb’s filament. Wouldn’t you know, though, that the bulbs used in these light strings include a “shunt” in parallel with the filament. This is comprised of a few turns of high resistance wire wrapped around the interior connections right near the glass bead. The purpose of the shunt is to continue carrying current through the string, so just the bad bulbs go dark. Apparently, these shunts can go bad (come unwelded) and then the whole string will go dark, as in my case. Unfortunately, if the shunt is good, but filament bad, the little sensor reads as a false positive, which only adds to the frustration. 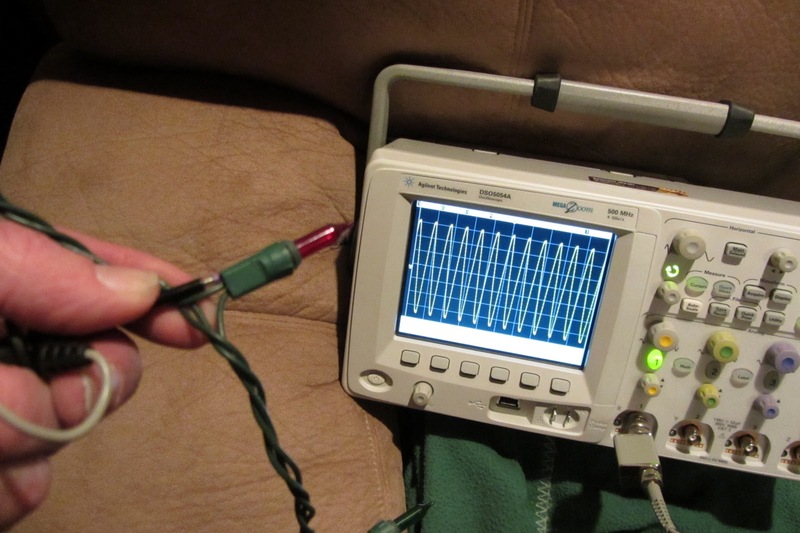 After a bit of research, (besides the usual “sniffer” probe sold by well-meaning stores (that works horribly), I discovered a couple techniques using either a couple neon lamps or some sort of “hum” detector – i.e., an oscilloscope, for example. I mean, why cobble up two neon lamps when you can use a $10,000 oscilloscope? 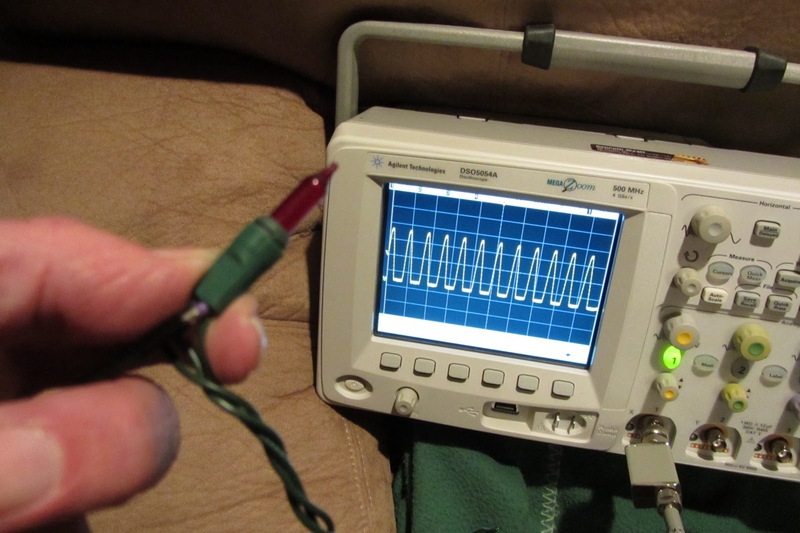 By applying power to the bad string (by reversing the line plug, if necessary), then probing with just the center pin of the scope probe…first in one side of the socket and then the other, you’ll eventually find the voltage changes (or goes to zero in some cases) at the bad light. It’s very quick once you get the hang of it. You’ll want to set up the scope to measure 10 to 20V/div (using a X10 probe) and display enough line voltage cycles to get a good indication. In my case, I either saw the full sine wave, or once I hit the bad bulb, saw a rectified sine wave. Our system is one of these strings that modulates the brightness with a song, so the control box may be doing something weird to the normal sine wave. In any case, it was relatively quick to locate the bad bulbs – two, plus a bad shunt, in this case. 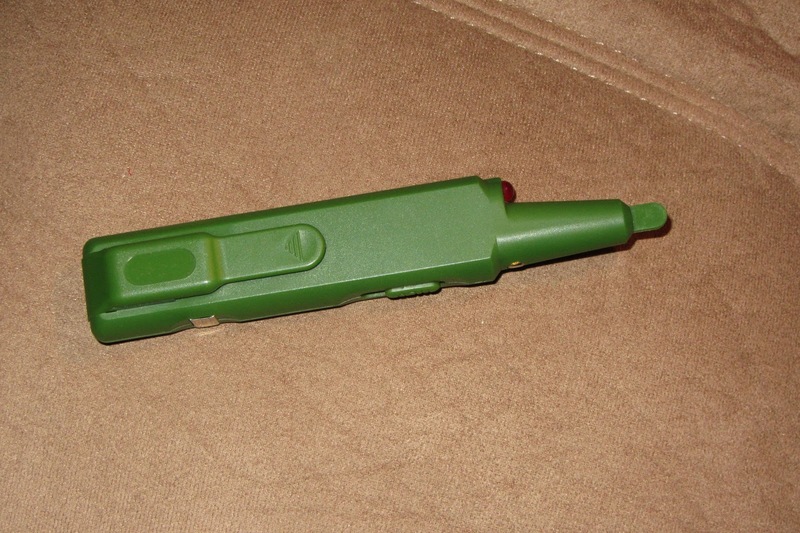 The scope probe’s ground wire is not used and simply clipped back on the scope cable. Remove the spring tip from the probe and use the sharp probe point to reach inside the back end of each bulb – both the input lead and output lead. Here, I’m measuring the input lead and all looks normal. Now probing the output side of the bad bulb reveals a different waveform, which is a big clue you’ve located the offending bulb. The waveform should have looked identical to the previous image. Replacing the two bulbs did the trick! I just posted a couple new reviews to the Technical Articles section of the Web. These include a review of a very useful USB Webcam that I use all the time during my EMC seminars for projecting instrument screens and experiment setups on the overhead projector. The second is a review of Henry Ott’s new book, Electromagnetic Compatibility Engineering (2010), a highly revised update of his previous textbook, Noise Reduction Techniques in Electronic Systems.